What this blog is about….. I remember when I was growing up my dad had a copy of E L Doctorow’s Ragtime on the bookshelf. Given my dad was a big fan of early jazz, I had at that time assumed that the book was a history of Ragtime. It wasn’t until much later that I realised that Doctorow was a novelist and it has taken until now for me to get round to reading any of his work. Homer and Langley is a fictionalised account of two real-life brothers Homer and Langley Collyer who lived in the bourgeois suburbs of New York in the first half of the twentieth century and earned reputations as being eccentric. In real-life the two brothers, one of whom, Homer, went blind, became increasingly withdrawn from society, paranoid and dependent upon each other. They died in March 1947 after which police discovered the body of Homer in his armchair, who had starved to death. Their mansion was piled high with collected rubbish and newspapers that they had hoarded over the years. During the clear-out the police finally found the body of Langley, buried beneath mountains of rubbish. The assumption is that Langley had fallen foul of one of the many booby traps he had set around the house to protect them from imaginary intruders and had become trapped beneath the debris. Homer had simply died waiting for his brother to come and attend to him. Doctorow takes considerable liberties with history. He makes Langley the older brother (whereas in real life the opposite was the case) and he stretches their lives well into the 1970s. Homer becomes blind as a teenager due to an illness that causes gradual deterioration. In reality, Homer became blind much later, in the early 1930s after suffering a stroke. In adjusting the timeframe in this way, Doctorow uses their story to comment on American society at critical times during the twentieth century. The narrative leaps quickly across the decades so that we get a snapshot of a particular period of a few months before moving us swiftly on to a number of years later. 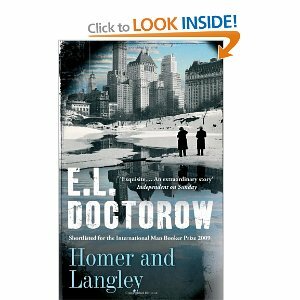 Where Doctorow is most successful is by painting a picture not of delusional madness, of everybody’s worst neighbours, but of extraordinary brotherly love in the face of a series of tragedies. They are abandoned by society as much as society abandons them and their withdrawal is an exercise in self-reliance and resilience as much as anything else. Time and again Homer and Langley are shown to be kind-hearted, well-meaning, non-judgmental, finding solidarity with others on the edge of society. They are, in their own way, brilliant, but unable to function in a rapidly changing society. Their hoarding is an ultimately doomed attempt to keep control of their lives and the outside world, but when the outside world invades their lives, they are shown to continually struggle and fail to successfully manage it. By narrating the story through the eyes of the blind Homer (pun intended), Doctorow allows us to enter their world and their struggles, well-intentioned but destined to end in yet further tragedy. And, of course, by allowing us to view history through the lives of people living on the very edge of a society that rejects them, he is able to make comment upon society itself. This is a deeply affectionate portrait of two brothers who don’t quite fit.